Madurai, also called as “Athens of the east” is the third populous city in Tamil Nadu and the third largest city in Tamil Nadu in terms of area. The city is one of the oldest cities in the world with settlements dating back to 2000 BC. The city is mentioned everywhere in Tamil literature. The city is filled with tons of temples and the city is also called as the temple city. Tall standing Meenakshi Amman temple is the iconic landmark of Madurai. People visit Madurai mostly to visit the temple. Madurai is a well connected city with road network. Madurai can be accessed from Coimbatore, Chennai, Banglore or Trichy. With all available routes, Madurai is the most accessible place in Tamil Nadu. You can book online bus tickets to Madurai from all major places in ticketgoose.com which is known to be India’s largest bus ticket booking portal. Meenakshi Amman Temple is the most iconic place in Madurai. The temple is located to the southern banks of Vaigai and it is dedicated to goddess Meenakshi. The temple dates back to its roots, the temple was rebuilt in 14th century and the temple was further expanded in 17th century. The temple is an important pilgrimage destination. The temple is fortified with walls and there are 4 entrances. The tower or ‘gopuras’ are found at the each entrance. The temple complex is big and it can hold thousands of people at a time. 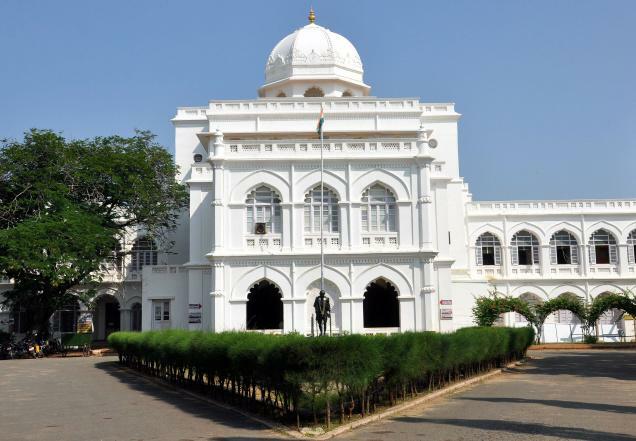 Thirumalai Nayak Palace was built in 17th century by Thirumalai Nayakar. He was the king belonging to Madurai’s Nayaka dynasty. who ruled Madurai from 1623–1659. The castle has multiple architectural styles. The place has a calm atmosphere and the lighting show in the palace is a must watch. Gandhi Museum houses artifacts related to Mahatma Gandhi. This is the best place for historians and people who all are interested in freedom struggle of India. The portrayal of freedom struggle is very inspiring. There is a book store and a khadi bhavan inside the museum. This traditional mosque at the heart of Madurai city. The place is 700 years old. It is located 500m from the Periyar (Central) bus stand. Hazrat Kazi Syed Tajuddin, who came from Oman during 13th century, received this land from the then Panidiya king, Koo(n) Pandiyan, and constructed the mosque which is the first Muslims’ place of worship in Madurai. Madurai has many more places to visit and architectural wonders must be seen to be felt. Book your bus tickets online in ticketgoose.com and enjoy your journey.